This tropical plant adapts to almost any environment, giving it a reputation as a hospitality, happiness and abundance plant. Known for its lush leaves and distinctive bloom shape we’ve paired it with Holiday birch cachepot. A perfect gift to add a festive feeling to either a home or office. 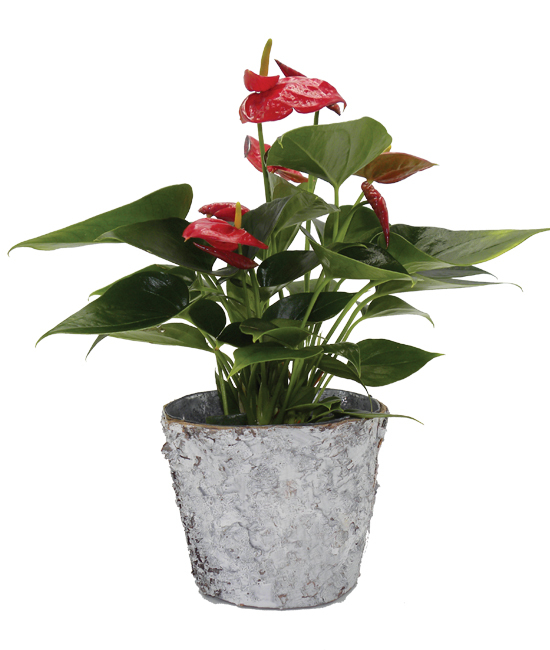 The 18″-20″ plant arrives planted in a 4″ grower’s pot in bud and bloom and is sure to make a marvelous centerpiece. Place your plant on a windowsill or in a sunny area but not exposed to full sunlight. Water your plant when the soil feels dry to the touch. Good drainage is essential and will help to prevent root rot. Avoid excessively hot or cold areas; however, it is tolerant to higher temperature conditions. Remove faded blossoms to encourage more blooms. Fertilize every two months for good flowering results.